Corpus Christi, Texas, birthed more than its share of garage bands during the explosive '60s, but when you get down to the crème-de-la-crème of the rockin' racket, the Zakary Thaks simply take the cake. 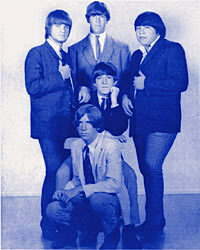 Sandwiched between the earlier, R&B-influenced Bad Seeds and the later psychedelically inclined Liberty Bell—with whom Thaks' lead singer Chris Gerniottis vocalized for a time—the Thaks were the band in Corpus and surrounding areas during the music's '66 to '67 apex. Evolving from the surf-leaning Riptides—who in turn grew out of the Marauders—the Thaks gained instant footing as an extremely tight and inventive group live, packing local joints like the notorious Carousel Club and causing mayhem in towns such as Austin, San Antonio, and even Lafayette, Louisiana. Drummer Stan Moore was the impetus behind their success, as he held the group to a rigorous practice schedule, insisting that they polish their set until it was nothing short of lethal. He also had a knack for picking songs that, in the words of Gerniottis, sounded as if they were "made for us." One night at the Carousel they were approached by hip greaser-turned-garage impresario Carl Becker, who—along with partner Jack Salyer—owned the local J-Beck concern. "You guys are tough," Becker told Gerniottis, handing him a J-Beck business card. Impressed with Becker's involvement in the music scene—he handled both the Bad Seeds and Tony Joe White—as well as his ability to get things done, the Thaks immediately inked a contract and were on their way to Jimmy Nicholls' primitive two-track studio in McAllen, Texas, to cut 1966's "Bad Girl and "I Need You," their first—and most legendary—single. They followed it up impressively with "Face To Face" and "Weekday Blues" in '67. "Face To Face" garnered a lot of local airplay, being kept from the number one spot by local Tex-Mex favorites Sunny and the Sunliners, whose "Put Me In Jail" just wouldn't budge. The Thaks gigged with national acts like the Yardbirds (for whom they opened the last show that Jeff Beck and Jimmy Page would play together) as well as other Texas legends such as the Thirteenth Floor Elevators, whose songs they often included in their set list. At one time they even featured a non-band member friend on the electric jug who would only hit the stage when they launched into an Elevators tune! Ironically, lead singer Chris was once asked to take Roky Erickson's place in the Elevators while Roky recovered from some mental problems but he flatly refused, stating that those shoes were too big too fill. Texas garage fans, many of whom hold the two bands on equal footing, might feel differently!